Whether you’ve started your own family or you recently became an aunt (or uncle! ), we can all agree that very little is more adorable than a kid dressed in cute clothes. The teeny proportions on a stylish furry jacket or dress are just about as “aw” inducing as it gets. And, sure, here at Who What Wear headquarters we don’t claim to be experts in the field of how to dress your children, but we certainly have an opinion or two on the subject. That’s why we rounded up the best winter outfits to dress your kiddos up in and included picks from some of our favorite brands that tailor to the tiny ones in your life. Scroll down for these adorable photos, and if you have any favorite brands we should be aware of, leave the links in the comments below. Layers, layers, layers! Put a coat on top of a dress, and add cozy accessories like earmuffs and tights. When the weather gets dreary, a trench coat, jeans, and sneakers are the way to go. Don't forget to grab the printed umbrella! A rain hat and coat are not only adorable, but quite functional, as well. Nothing beats a dress and leggings. If temperatures are especially cold, put a leather jacket on top. You can't go wrong with a furry jacket and pleated skirt. That hair bow doesn't hurt, either. Add a little personality to a sweater and blue jeans with a playful beanie and toggle coat. Got a kiddo who likes to flaunt their style? Try a printed coat and glittery boots. 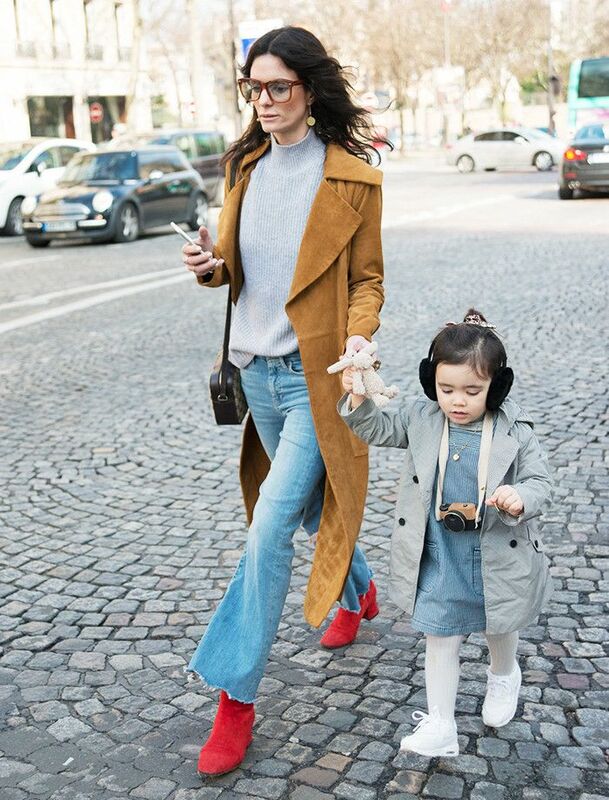 A mini toggle coat is adorable beyond words. Can they make this in adult size? To make squeezing them even more cozy. Don't forget plenty of pops of color! Keep those ears stylishly warm. A great pair of tights that can be worn with everything is key. Pair with some thick leggings and sneakers. Love kids? Check out Baby2Baby to help low-income children.